25mm, bottle opener, gadget, magnets, mirrors, personalized pins, pins, pins. Press for interchangeable pins 25 mm , magnets and other customizable gadjets of 25 mm. This is ideal for all those need to produce medium-big amount of material. It’s comfortable, intuitive and easy to use. Infact this press allows to realize badges and magnets in a few steps. Its structure is formed from stainless steel parts, aluminum parts, sled for the molds and rubber handle pressing allows that the press is solid and stable. 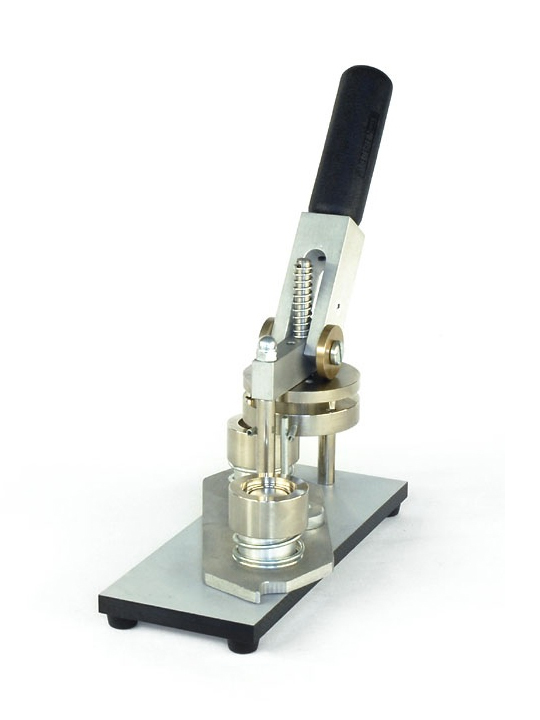 Four little rubber foot, that are located at the base, don’t slip the press during the use. The operation of pressing of the button is easier thanks to the longer lever. This tool allows to realize 250/500 pins each our. – Insert the curved blade on the first station, the graphics already cropped and the and acetate film for the plasticized. – Press (starting from the first station) and the pin is finished!